L'ovedbaby - Clothing OR111SF - X 37 in. Prints: 36 in. The absolute best swaddling blanket, it is extremely soft, cozy and stays put. Sized to last through toddlerhood and beyond all l'ovedbaby's organic cotton garments are made with GOTS - certified organic cotton, meaning the fabric meets the Global Organic Textile Standard, the world's leading processing standard for textiles made from organic fibers Gots-certified organic blanket; ethically made in India. With its rounded corners and stylish solid colors or stripes, this roomy blanket is perfect for swaddling or going out-and-about with your little one. No alkylphenols, organotin compounds, chlorobenzenes, mercury or chromium, phthalates, short-chain chlorinated paraffins, flame retardants, lead, azo dyes, chlorinated solvents, cadmium, perfluorinated chemicals, chlorophenols, sometimes used in clothing. L'ovedbaby Unisex-Baby Newborn Organic Swaddling Blanket, Seafoam, one Size - Solids & stripes: 37 in. X 32 in. Very stretchy, perfect for swaddling and beyond. Pair this blanket with a L'ovedbaby footie and cap for a perfect take-me-home set. 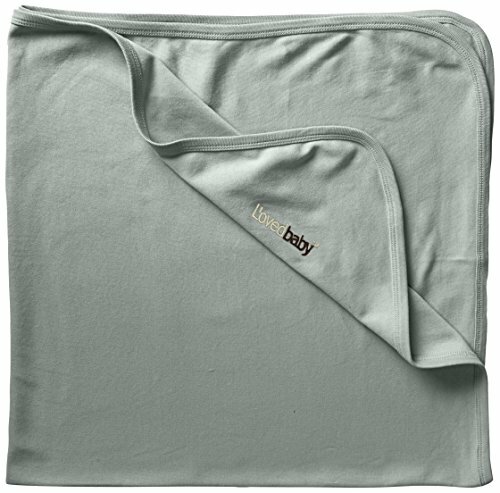 This soft, 100-percent organic cotton swaddling blanket by L'ovedbaby is both practical and beautiful. Available in solid colors and stripe color ways, it is generously sized at 37 x 37 and stretchable up to 45. L'ovedbaby OR334 - Little ears stay covered for added warmth and protection in this adorable cap, which comes in solid colors and stripe colorways, ideal for playing mix-and-match machine wash/dry. Available in 5 convenient sizes note: size 12-24m is the tie-back version that adjusts as baby grows. All l'ovedbaby's organic cotton garments are made with GOTS - certified organic cotton meaning the fabric meets the global organic textile standard, the world's leading processing standard for textiles made from organic fibers Form-fitting infant cap with logo patch. This 100-percent organic cotton, form-fitting cap is the perfect accessory to go with any of the L'ovedbaby cotton basics pieces. Size 12-24m features adjustable tie back. L'ovedbaby - Infant footie with snap buttons from neck to foot and fold-over mitten cuff long sleeves. Sizes 6-9m and 9-12m do not have fold-over mitten cuff. This 100-percent organic cotton overall with feet is super-soft and offers a perfectly snug fit each time. Size 12-24m features adjustable tie back. In all sizes, the garment has underfoot rubber-dot soles to prevent slipping.
. All l'ovedbaby's organic cotton garments are made with gOTS - certified organic cotton, meaning the fabric meets the Global Organic Textile Standard, the world's leading processing standard for textiles made from organic fibers Form-fitting infant cap with logo patch. Sizes 6-9m and 9-12m have rubber-dot soles to prevent slipping. L'ovedbaby Unisex-Baby Organic Cotton Footed Overall - In the nb, the garment has a fold-over, 0-3m and 3-6m sizes only, gl'oved-sleeve option for added warmth and protection from self-scratching. Sizes 6-9 and 9-12m, there are no fold-over options on the sleeves, since older babies need to have free hands to develop and explore. The newborn size, paired with a L'ovedbaby hat and swaddling blanket, makes the perfect take -me-home outfit. Available in solid colors, stripe color ways and 5 convenient sizes. L'ovedbaby - Nb size is 0-7 lbs, perfect for preemies. Machine Wash. 4-snap closure makes it easy and convenient to carefully dress your newborn, fold over gl'oved sleeves offer protection from self-scratching. Fold-over, gl'oved-sleeves offer added warmth and protection from self-scratching. This comfy gown is a simple diaper-changing solution for Mom and Dad. L'ovedbaby's organic cotton gown is available in solid colors, stripe color ways, and 2 convenient sizes: newborn up to 7 lbs. L'ovedbaby's organic cotton gown is available in solid colors, stripe color ways and 2 sizes. Two tiny front pockets add a little style, while the 4-snap closure makes it easy and convenient to carefully dress your newborn. L'ovedbaby Organic Infant Gown - . All l'ovedbaby's organic cotton garments are made with gOTS - certified organic cotton, meaning the fabric meets the Global Organic Textile Standard, the world's leading processing standard for textiles made from organic fibers Form-fitting infant cap with logo patch. At birth and 0-3 months. Size 12-24m features adjustable tie back. Imported. 100% organic Cotton. Sizes 6-9m and 9-12m have rubber-dot soles to prevent slipping. Infant footie with snap buttons from neck to foot and fold-over mitten cuff long sleeves. L'ovedbaby - Imported. 100% organic Cotton. Machine Wash. Nb size is 0-7 lbs, perfect for preemies. Sizes 6-9m and 9-12m do not have fold-over mitten cuff. Sizes 6-9m and 9-12m have rubber-dot soles to prevent slipping. All l'ovedbaby's organic cotton garments are made with gOTS - certified organic cotton, meaning the fabric meets the Global Organic Textile Standard, the world's leading processing standard for textiles made from organic fibers Form-fitting infant cap with logo patch. Seamless 100 percent organic cotton kimono style bodysuit wraps baby in total comfort. Imported. Available in solid colors and 3 convenient sizes: nb, 0-3m and 3-6m. Infant footie with snap buttons from neck to foot and fold-over mitten cuff long sleeves. 100% organic Cotton. 4-snap closure makes it easy and convenient to carefully dress your newborn, fold over gl'oved sleeves offer protection from self-scratching. L'ovedbaby Unisex Baby Organic Kimono Bodysuit - . Size 12-24m features adjustable tie back. Nothing is pulled over baby's gentle head with this smart wrap-around design, while the gl'oved-sleeve feature offers added warmth and protection from self-scratching. The seamless torso of this kimono style bodysuit wraps baby in total comfort and style. Our cotton basics clothing utilizes 100 percent GOTS Certified Organic Cotton, minimally processed using safe and gentle water-based dye for color, safety tested and compliant with CPSIA. L'ovedbaby - Machine wash and dry. 100-percent organic cotton, an easy to wear must-have for any little girl. Our cotton basics clothing utilizes 100 percent GOTS Certified Organic Cotton, minimally processed using safe and gentle water-based dye for color, safety tested and compliant with CPSIA. Imported. Our cotton basics clothing utilizes 100-percent GOTS Certified Organic Cotton, minimally processed using safe and gentle water-based dye for color, safety tested and compliant with CPSIA. Available in solid colors, 6-9m, 3-6m, 9-12m, stripe colorways for both boys and girls and 6 convenient sizes: 0-3m, 12-18m and 18-24m. Machine Wash. Seamless 100 percent organic cotton kimono style bodysuit wraps baby in total comfort. Sizes 6-9m and 9-12m do not have fold-over mitten cuff. Nb size is 0-7 lb, perfect for preemies. L'ovedbaby Unisex Baby Organic Leggings - . Machine washable. Size 12-24m features adjustable tie back. L'ovedbaby's organic cotton gown is available in solid colors, stripe color ways and 2 sizes. Mix-and-match with any of the L'ovedbaby dresses or shirts. Available in 8 solid colors, 5 stripe colorways and 7 convenient sizes. L'ovedbaby - Clothing - Machine Wash. Machine washable. Seamless 100 percent organic cotton kimono style bodysuit wraps baby in total comfort. This 100% organic cotton short- sleeve seamless kimono style bodysuit wraps baby in total comfort and style. Infant footie with snap buttons from neck to foot and fold-over mitten cuff long sleeves. Imported. Machine Wash. Form-fitting infant cap with logo patch. Sizes 6-9m and 9-12m do not have fold-over mitten cuff. Imported. 100% organic Cotton. Nothing is pulled over baby's gentle head with this smart wrap-around design. Our cotton basics clothing utilizes 100-percent GOTS Certified Organic Cotton, minimally processed using safe and gentle water-based dye for color, safety tested and compliant with CPSIA. L'ovedbaby Unisex Baby Organic Short-Sleeve Kimono Bodysuit - L'ovedbaby's organic cotton gown is available in solid colors, stripe color ways and 2 sizes. Size 12-24m features adjustable tie back. Available in 8 solid colors and 3 convenient sizes: newborn, 0-3m and 3-6m. Our cotton basics clothing utilizes 100 percent GOTS Certified Organic Cotton, minimally processed using safe and gentle water-based dye for color, safety tested and compliant with CPSIA.
. 100-percent organic cotton, an easy to wear must-have for any little girl. - Nb size is 0-7 lbs, perfect for preemies. Kimono-inspired bodysuit with asymmetrical button front and short sleeves. This adorable organic cotton baby footie is super-soft and offers a perfectly snug fit each time. Note that sizes 6-9m have the same great design, but NO fold-over sleeves. Our cotton basics clothing utilizes 100 percent GOTS Certified Organic Cotton, minimally processed using safe and gentle water-based dye for color, safety tested and compliant with CPSIA. Sizes 6-9m and 9-12m do not have fold-over mitten cuff. Our cotton basics clothing utilizes 100-percent GOTS Certified Organic Cotton, minimally processed using safe and gentle water-based dye for color, safety tested and compliant with CPSIA. Machine washable. Rubber-dot soles to prevent slipping. 100% gots certified Organic Cotton. L'ovedbaby Unisex-Baby Organic Cotton Footed Overall - 100% organic Cotton. 4-snap closure makes it easy and convenient to carefully dress your newborn, fold over gl'oved sleeves offer protection from self-scratching. Infant footie with snap buttons from neck to foot and fold-over mitten cuff long sleeves. Form-fitting infant cap with logo patch. Fold-over sleeves for protection from self-scratching 0-3 mo, 3-6 mo only. BF101 - Our cotton basics clothing utilizes 100-percent GOTS Certified Organic Cotton, minimally processed using safe and gentle water-based dye for color, safety tested and compliant with CPSIA. 100% organic Cotton. Incredibly soft fabric-it is the perfect choice for all day wear. The gloved sleeves in all sizes provide protection, while the cozy footies keep little toes warm. Kimono-inspired bodysuit with asymmetrical button front and short sleeves. With center snap closure, changing is a cinch. Machine washable. Seamless 100 percent organic cotton kimono style bodysuit wraps baby in total comfort. Infant footie with snap buttons from neck to foot and fold-over mitten cuff long sleeves. bonamy Baby Unisex Organic Cotton Gloved Sleeve Footie - Mix-and-match with any of the L'ovedbaby dresses or shirts. Fold-over sleeves for protection from self-scratching 0-3 mo, 3-6 mo only. Our cotton basics clothing utilizes 100 percent GOTS Certified Organic Cotton, minimally processed using safe and gentle water-based dye for color, safety tested and compliant with CPSIA. Available in 8 solid colors, 5 stripe colorways and 7 convenient sizes. L'ovedbaby's organic cotton gown is available in solid colors, stripe color ways and 2 sizes. Nb size is 0-7 lb, perfect for preemies. L'ovedbaby - Machine Wash. Machine washable. Machine Wash. With center snap closure, changing is a cinch. Seamless 100 percent organic cotton kimono style bodysuit wraps baby in total comfort. L'ovedbaby's organic cotton headband is available in solid colors and 3 sizes. Slim fit, designed to be form fitting. Incredibly soft fabric-it is the perfect choice for all day wear. Attach any clip or barrette to the center loop of the headband for endless combinations of cuteness. Nb size is 0-7 lb, perfect for preemies. Attach any clip or barrette to the center loop of the headband. Hidden snaps are designed for classic style. Imported. A cute addition to any outfit. Kimono-inspired bodysuit with asymmetrical button front and short sleeves. L'ovedbaby Baby-Girls Newborn Organic Headband - 100% gots certified Organic Cotton. Mix-and-match with any of the L'ovedbaby dresses or shirts. Our cotton basics clothing utilizes 100-percent GOTS Certified Organic Cotton, minimally processed using safe and gentle water-based dye for color, safety tested and compliant with CPSIA. Infant footie with snap buttons from neck to foot and fold-over mitten cuff long sleeves. Whether your little l'ovedbaby is still bald and beautiful, or has a head full of hair, this headband is the perfect topper. L'ovedbaby - With center snap closure, changing is a cinch. 100 percent organic cotton bodysuit features a soft and snug fit, a perfect layering piece. Need bigger sizes? see l'ovedbaby Long-Sleeve Bodysuit. All l'ovedbaby's organic cotton garments are made with gOTS - certified organic cotton, meaning the fabric meets the Global Organic Textile Standard, the world's leading processing standard for textiles made from organic fibers Form-fitting infant cap with logo patch. 100% organic Cotton. Machine Wash. Machine washable. Our cotton basics clothing utilizes 100-percent GOTS Certified Organic Cotton, minimally processed using safe and gentle water-based dye for color, safety tested and compliant with CPSIA. Our cotton basics clothing utilizes 100 percent GOTS Certified Organic Cotton, minimally processed using safe and gentle water-based dye for color, safety tested and compliant with CPSIA. L'ovedbaby Organic Gloved-Sleeve Bodysuit - Imported. Fold-over, gl'oved-sleeves offer added warmth and protection from self-scratching. Hidden snaps are designed for classic style. 100% organic Cotton. Seamless 100 percent organic cotton kimono style bodysuit wraps baby in total comfort. Slim fit, designed to be form fitting.